Well, here we are, in the Gibbous Moon Phase and the day Moon here is big and glorious! One can see the sunset in the west and the moon in the east at days end! Magical stuff really if you let yourself go there! I mean linger in the view of the Moon and Sun, contemplate it, and really enjoy@! Well, my Lunar enthusiasm gets me going–pardon. Akhhemm, [clearing throat and getting serious now] so Gibbous Phase and in 3 days the Moon will be gloriously full. This is the last part of the waxing phase in the Lunar Cycle… after the Full (180°), the Moon begins to “wane” and the cycles are tagged with that word. In the last phase [waxing First Quarter] the words ‘forewarned is forearmed’ and that was about the old shells of old energy that litters the field of consciousness and about repudiating the past [patterns of consciousness]. Commitment has been growing and takes hold fully in this phase. There is a strong awareness now of needing others to do psychic work—both those in spirit world and in the human realms. A little self-analysis at this time goes a long way. The psychic work here may be adjusted and tweaked or the psychic may consider doing the work just a little bit differently than in the past. Now we have ‘gone over the waterfall’ so-to-speak and we are independently and fully committed to what we intended during the New Moon several weeks ago [ on September 24th to be exact ]. Whether we were conscious of it or not, the New Moon energy set something into motion [positive or negative] and now we have it clearly before us in one way or another. Co-operation is a key word for this lunar phase as well as co-creation. The desire underlying motivation toward this co-operation with others and they with us is fellowship–networking, team players and meaningful connections are expected now. RED FLAG WISDOM: A red flag in this phase is that because we are so willing to compromise and create with others, those who like to take advantage for their own purposes can do so too easily — so discernment is also highly associated with this phase of the Moon. Not being to gullible or trusting or naive–because we have a natural feeling now to co-operate with others, if we don’t use discernment, we can become victims. Everyone wants to be loved and appreciated but there are those who will use that to their own advantage, so that’s one thing to know and be aware of at this time. Word to the wise as they say. In this Waxing Gibbous Phase, the Sun and Moon are 4 or 5 signs apart. This months’ Gibbous Phase cycle began at 15° Aquarius. The same element–thus the cooperation. 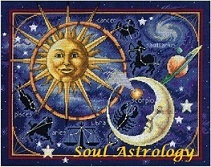 Aquarius is an Air sign and so is Libra where the Moon was when this cycle began–two air signs co-operate well. So the Sun and Moon are at ease and in accord and the energy now can be easily harnessed. Astrologer Dane Rudhyar says that people who are born with their Moon in this phase are eager to contribute meaningfully to society and they may devote their life to a cause. People born in this Virgo-type cycle (ruled by Mercury) have keen minds and a way of connecting the dots with ideas. Verbal abilities will be strong now with the Sun/Moon relationship being in air signs. 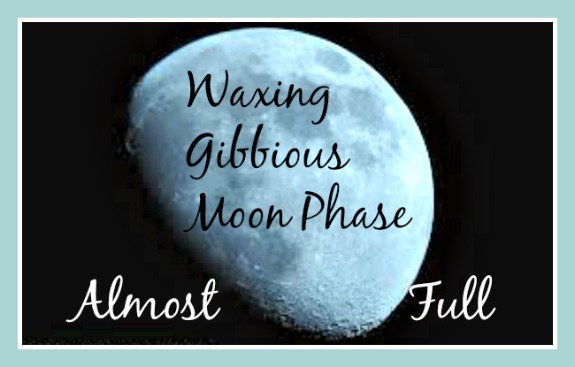 The Gibbous phase allows for adjustments and preparation. Personally, I’ve felt that part most of all–the need for preparation. I’ve been getting paperwork together, making photocopies and doing that Virgo-type thing that is associated with that intention that I had back at the New Moon and that I’ve received hints will be manifesting. I got a call during the New Moon and was told what paperwork is needed and while the Moon was in this phase I’ve had a strong pull to get that done. Like I said, preparation and adjustments are a strong part of this Mercury ruled phase. We can be doing self-analysis in this phase too–that’s part of the internal adjustment mentioned above and thus, humility is associated with this phase as well. And personally I must add the word “awe” to this phase from my own perspective. Gemini-like internalization leading to action. There is an inner feeling of wanting to be prepared so that there is no rejection on any level in the next phase Feelings of inferiority need to be conquered in this phase and one will be helped in many ways to feel worthy in preparation for the upcoming Full Moon energy–that is if during the Waxing First Quarter phase one didn’t let doubt crumble the structure or get tripped up in the wasteland of old patterns. I have not revealed on the blog what seeds I planted during the New Moon–not yet or many not ever. I am keeping that under my hat for now–at least for now. See you at or after the Full Moon: 15° Aries! October 8th, 2014, Wednesday. Alright! We’ve landed on Day #28. Something really big is going to happen (if all goes as planned–and it will~!) on Day #37. So there’s 9 more days to go and its a bit difficult to be patient now. That’s probably my own fault for being too much of an overachiever which really stems from fear-ish like paranoia that goes this way: Hurry and don’t put things off in case at the last-minute something happens and you run out of time or some other type of energy! I was that way in college too–always had my assignments done and ready to hand in ahead of time. And then when the professor gave time extensions because others weren’t ready, the temptation to be righteous about it was hard to resist. 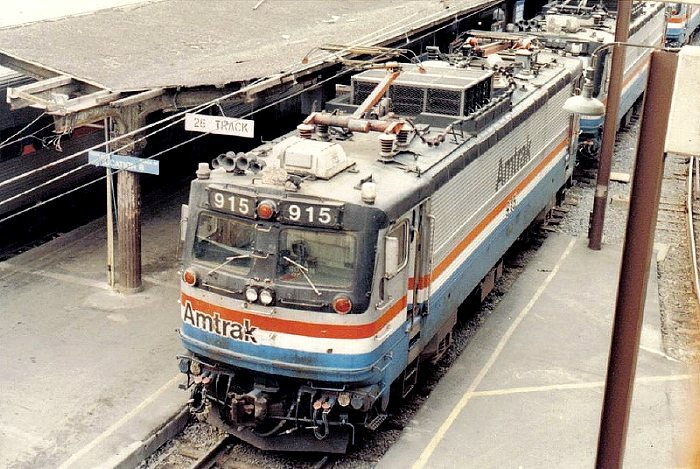 Anyway, better to be early rather than late–ask my family; I’d always get to the plane or train hours early. Hurry up and wait–that’s me. You too? Well that’s just how some of us are wired; embrace the neurosis. As phobias go, there are worse ones to have I suppose. Yet, I am still feeling a bit of that feeling from Day #22… you know, the protective roof being removed yet do see the prediction from a week ago about quick and steady progress has indeed been manifesting! This past weekend my daughter and I worked harmoniously together to the tune of gearing up the final stages of things–she was a great help to me. I am finding that I am letting go of a way of life that I’ve held for 9 years on one level and about 14 years on another and it totally feels like a new phase, a new chapter–the page has been turned! I am saying goodbye to the old and piecing together in my mind what the new will be like and how I will use my time in new ways. I think it’s good that these final 9 days are ones in which I can gradually slow down, look around and inventory the whole affair. That parenthesis above mean nothing to do if you don’t know astrology and I apologize since I did not spare you the details. Yeah, so anyway… 9 more days and an old part of my life goes bye-bye and a brand new adventure begins! I’m getting some hints about what’s coming–people are asking me to teach astrology and I’ve been thinking about it all at the same time. It’s only Wednesday and already 4 people have asked me about teaching an astrology class. I hesitate thinking I don’t know enough, but then again I do know a bit more than a brand-new beginner would and those types would be my target students I suppose. I intend to teach an in-person local psychic development class–and now I am mental-izing how to follow through with these ideas. I’d love to interact in person with students–the Internet class is fine but I’m open to expanding that and these are ideas ruminating in the mind right now. We’ll see how it goes but this is how my psyche and spirit work it seems–people start asking me to do what I’ve been thinking of doing and so that becomes like the validating push. Does it work that way for you too? Right–so anyway after having recovered from some physical fatigue and spent short segments of time staring at the ceiling over the past weekend it was like two steps forward and one step back. I seem to have to integrate it during a rest phase and then get back at it again as I work toward Day #37. At the start of this sudden project and committment toward a major change, I didn’t know if it would take 30 days or 60. Things have been moving quickly as I’ve said all along. Any periodic apprehension is being handled by me through intense devotional prayer work to which I find that something happens shortly after to soothe any of that by giving some supportive validation–something encouraging happens to smooth over any worry wrinkles. Bad for the complexion as well as the soul–those are! Not much more to report about it all but to say when Venus was doing her transit over the Sun which started from 6 pm EDT last night I happened to be dealing with my check book, bank balances, bill payments and the like! Didn’t think of that until today but Venus does rule the 2nd house which is often associated with “money”. I don’t know what conclusion to draw from that really. So what! Right? 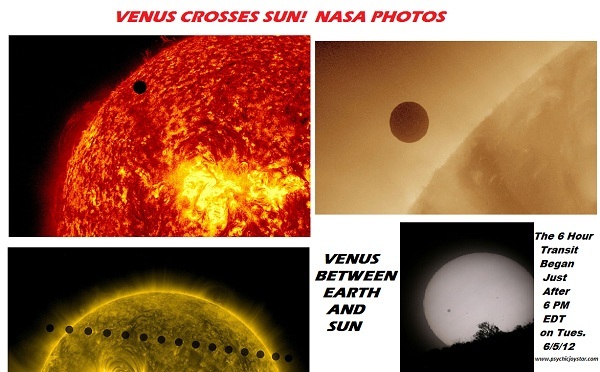 Yet as Venus came between the Sun and Earth we all must have received some sort of energy programming or the like. Since my mind was, at that time, on $money$ issues, perhaps I was receptive to some positive programming from Venus energy as it relates to my essence, which for all of us is our Sun. I do recall lecturing to myself as I began the task of looking at the money situation. I told my self that I will not become in any way upset about money as I worked on the task! And I meant it! And I didn’t! With my progressed Sun moving into the 5th house related to “children”, my relationship with my own daughters is strengthening and this grow more so each day. 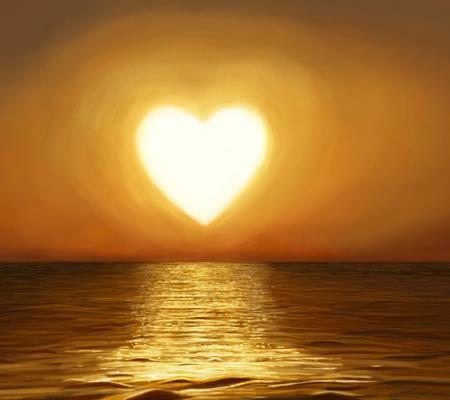 Perhaps the Venus-Sun transit will help to continue to renew those loving relationships in the days ahead. I’ve a client calling for a session and a busy afternoon ahead… I am asking to remain busy over the next 9 days so that I can forget the time to experience it quickly! Meanwhile, each day I find that I am substituting any experiences of fear as they come up in the emotional body with trust and hope. It becomes easier to do so despite anything else that should appear, regardless of what it is. Onward and upward as they say! When you consciously embrace an experience of fear while shifting your vibration into trust or hope, you evolve! expand! enlighten! You GO! I totally get to live it now (again!). I get to apply firsthand all the advice that comes from the higher levels of mind about change, impermanence, transition, letting go/holding on (an interesting dynamic!) and all the rest. O, not that I haven’t lived it in the past—it’s a refresher is all. Anytime we make a decision that is going to obviously out-picture in a major life change, we have moments—call them temporary moments of insanity if you’d like. I may have had a few of those this week. I am laughing inside as I reflect on that last line; there’s a part of me that’s still a bit numb and consequently unsure if I’ve been completely sane the entire week. I think it’s normal as a portion of life unravels and then begins to reassemble due to the necessity of change that moments of “crazy” happen and there again come those old buddies of worry who is crazy’s cousin. Those buddies are doubt and anger. What’s there to be angry about you may ask—don’t worry, I’m asking myself the same question. Maybe it’s my rebellious Aquarius energy in my 7th house—who knows? I really have to get over a certain amount of resentment about jumping through other people’s hoops and dealing with “THE almighty RULES”. Yeah, I’ve always been a fringe dweller, an outsider. I’m examining that now; that frustration and resentment. But I got through the week and with regard to this project, this commitment, this change–the ball is continuing to roll with or without me because things have been set irreversibly into motion. Last night I had as moment of angst. Now this is where divination comes in handy! Maybe it was me just tired from a long week of bumping heads with… let me be kind. Let’s just say maybe a certain fatigue set it that wasn’t necessarily physical. Mentally I am living (in my mind) within the new way of being that comes from this change that I’ve chosen (did I really choose it?) and physically there is chaos in the realm that I’m still disassembling as part of the change. Holy chaos! What am I doing? Am I doing the right thing? I keep getting flashes of the transiting lunar nodes about to come to merge with my natal lunar nodes—once I heard an astrology teacher say that this is… well, she said, “The past becomes the future and the future becomes the past.” I really do feel like something quite similar to that is going on with all of this! And you’re at the point with it where it is way too complicated to change your mind now! You know, like you just strapped your body in the roller coaster and it begins to move and you really wish you could get off the thing and it’s way too late to turn back now! Okay, so I had a moment like that last night you see? Those kinds of moments can be sort of immobilizing—everything freezes and you feel like you have to go put your head on the pillow for a while and consider everything one more time. If you’re experienced with life—it’s familiar territory. You just want someone to come down from some heaven somewhere, float down through the walls and tell you that you are doing the right thing. That didn’t happen exactly, so I grabbed a few divination tools and did ‘my thing’. It is calming to shuffle those cards or toss those coins—if nothing else, shuffling the cards is a centering activity in itself. It was helpful is all that I can say—very helpful—calming, reassuring, peace-provoking and enabled me to breathe easy once more. I’d say the whole affair took maybe a half hour and I was back on course again emotionally. I was still physically tired but got a lot of good rest last night and today I’m ready to go back at it again. And the chaos of change I must make peace with until the 30 days is over. Around this same time next month, I should have totally different view of life; stay tuned. 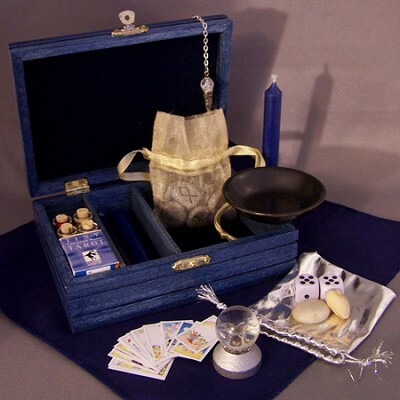 But my greater point is that divination tools, used properly and with confidence in the tool itself, can be so helpful in the heat of the moment when guidance and an elevated, unbiased view is needed. It’s worth learning about tarot cards or runes or i-ching and to take a psychic development class before you consider a major change; they can help you. As a matter of fact, now that we are thinking of it, I’ve noticed that many people who take the class are also planning something huge in their life at the same time—some life changing event like a job/career change or divorce or a relocation. I’ll post again when there’s time. Despite what you may be thinking right about now, my marathon running boss was a great mentor and a really was a “good guy”. He just called it as he saw it. He was, in so many ways, a teacher for me—like Yoda was to Luke Skywalker in Star Wars. Anyway… those are the first thoughts that came to mind when I saw that today’s cosmic communiqué had to do with the I-CHING Kua 32 which is called “Duration” — it is also called “Endurance” and “Long Lasting”. Today’s message is about hanging in there for the long haul—not being a quitter and keeping commitments; especially those made to one’s self. I never had a pipe dream about running 6 miles every single day—my energy was never that consistent in the running department. But it has been in other areas… in the ones that really, deeply mattered to me. That’s true for the most part; but I think that all of us, if we are totally and completely honest will have to admit to times that we broke our own vows to our self. Let’s face it; some things in life can stand the test of time and others–well, maybe they weren’t supposed to. Who knows? Here is where considering averages can be helpful—do you find you persevere and are consistent in most cases? What’s your average? The “spirit” of duration holds the vision rain or shine, feast or famine – you remain steadily on course and can adjust to change without compromising the goal. In how many areas of our life can we truthfully say this is our actual reality? That’s what today’s message is about—the maturity of making a commitment and to persevere come what may. 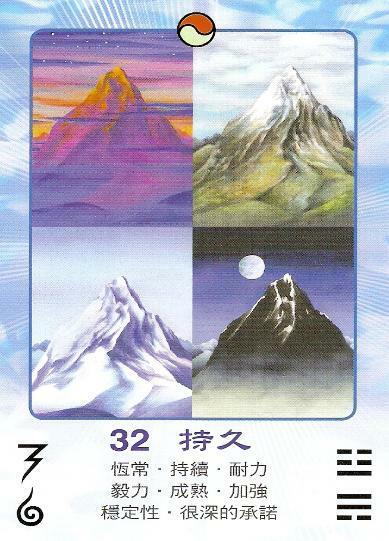 Where is it in your own life that you can be like the image on the card—the mountain that is unchanging through the seasons, unmovable no matter what the seasonal outer weather brings? Contemplation: How well do you keep promises to yourself and are you consistent over time? How well do you ‘hang in’ through the highs and lows of life? We can clearly see how well our resolve holds by observing our own dignity and inner strength when faced with adversity. I will be thinking about this today; would you like to join me? With Saturn retrograde in Libra, not going direct again until June 12th (2011) and today’s card and astrological connection being about non-commitment in relationships, it seems the divine messengers want to talk about that very thing today–relationships. I’d say that today’s message would apply to any type of relationship whether it be work related, family related, friend related or lover related. Many times we see a lack of commitment in relationships occur due to that age-old scorpionioc (is that an actual word-?) fear of betrayal, fear of loss, and lack of trust due to same. Many times people want to just be friends–just like the pictures we often see on the tarot card, 6 of cups. Can’t we just be friends?–says one partner. And the other says–No, I want your commitment. Funny how that goes! The one who wants the commitment is usually the one who has the greater fear of committing to a partner in the first place and that’s why they draw that kind of partner in to start with. Scorpio energy wants to merge, blend and become one yet at the very same time is fearful of being hurt in the process. A dichotomy! How is that resolved? By developing emotional self-reliance, but that’s a whole other blog for another day. Saturn retrograde in Libra (as it is now) can help us review our relationship patterns. It almost feels like relationships now, business, personal or otherwise are a bit stalled out. People seem to not exactly know for sure what in life, if anything, to commit to. Sometimes life offers us something pretty wonderful, but we put our hands behind our backs, not willing to accept because we are being suspicious of everyone’s motives. That’s Scorpio energy–at least one way the Scoroio archetype expresses. 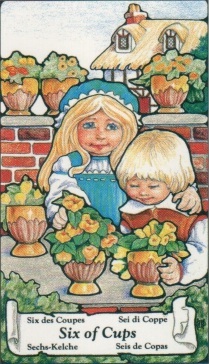 The bottom line message for today is not to take life so seriously, allow yourself to play with others in life in a loving and friendly way without worrying about commitment (either giving one or asking for one) for right now–get in touch with your childlike innocence, adding more fun time to your life. When Saturn, the planet ‘of’ commitment moves forward again after mid-June, why not re-evaluate these areas of concern again then? For now, accept life as it is and don’t take it all so seriously. Adopt an attitude of feeling blessed by all the simple joys of your human connections with others and release the Saturn-judgments. Try to be, just for a little while, blissfully unaware about the human/societal relationship rules and regulations. Think the best of others and you will experience the best in them and in life in general. Perhaps be willing to consider what is being offered in life without being overly-suspcious about it — that is the other message here.